Though it was a deserving choice for the extemely selective dramatic film competition at Sundance 1997, Black & White & Red All Over is not the type film which distributors are going to throw their money at, or theaters offer an open run. In truth, there's little commerciality in this somber, unsentimental Cambridge-set tale of twentyish African-American friends, five guys and one woman, who come completely apart in several days of mostly off-screen black-on-black violence. But there's much to admire in this serious-minded work jointly written and directed by three bursting-with-talent local filmmakers, Harry McCoy, Khari Streeter, and Demane Davis. What's the film about? A family has been shot dead in Roxbury by gang members, that's what we see on TV as the six friends settle on an apartment couch in Cambridge channel-surfing. Two of the group look as if they might be involved: they deal dope, they secretly pack guns. Gradually, even the most peaceful, job-ambitious of the group get sucked into the off-camera cycle of violence. 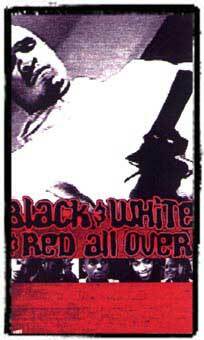 Black & White & Red All Over is an in-your-face warning to young blacks to stay cool, not kill your own. The screenplay's too much on the talk-talk side, but it's smartly written and the actors have great ease playing it with conviction. Plaudits too to Jonathan Bekemeier's fine black-and-white cinematography and to David Steele for a vigorous original jazz score.